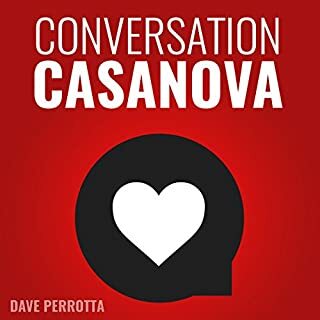 Written by Blackdragon, one of the most well-known online dating experts in the world, this audiobook is filled with the latest and most effective techniques for getting dates with women using online dating sites and apps. 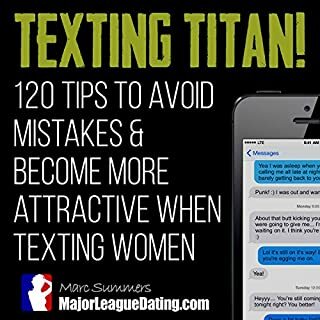 Taken from a decade of online dating experience from not only him, but thousands of men all over the world, the techniques you will learn in this audiobook are the most effective you will find anywhere. "When I discovered this strategy, I was initially scared to share it with the world. I didn't want to become a dating coach and the stigma associated with that. However I knew I had to write this. I was frustrated with all the pain I saw inside men stopping them from getting the women of their dreams. I'd been there, and I wish I'd known this strategy earlier." You'll learn how to turn the number one barrier stopping men from chasing the women of their dreams, fear of rejection, into your ally. You'll completely eradicate approach anxiety from your psyche forever, and most importantly you'll acquire the number one trait that women find most attractive. 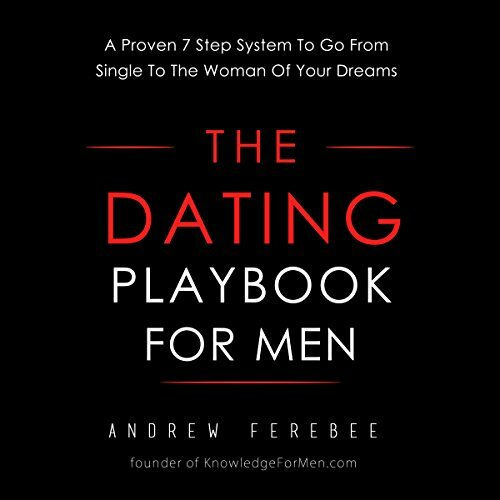 Where does The Dating Playbook For Men: A Proven 7 Step System To Go From Single To The Woman Of Your Dreams rank among all the audiobooks you’ve listened to so far? This is actually the first audiobook I've downloaded. However, I do have the book in written format. What was one of the most memorable moments of The Dating Playbook For Men: A Proven 7 Step System To Go From Single To The Woman Of Your Dreams? Many of the steps provided in the book are grounded on sensibility and hope. Any man should be able to improve their dating life with these steps. You'll be hooked! Andrew does a great job of breaking down what a guy needs to do to improve his dating life. If that's your goal, give this book a shot. If you could sum up The Dating Playbook For Men: A Proven 7 Step System To Go From Single To The Woman Of Your Dreams in three words, what would they be? forget 3 word summaries. It was transformative! This book is amazing and it has something for everyone. What shocked me the most was how much it improved my confidence before I even tried any of it. I began listening to it after a crappy breakup and within hours was like "f-yeah, I'm pumped to start bettering myself and showing the new me off to the world!" Seriously, I poured through this thing in less than a week and found myself doing many things I was previously scared to do. I don't care to relay all the details but before I even finished the book I got out there to practice the teachings and was rewarded with a lovely little success story! Lastly, I really loved that this book was least cheesy/sleezy thing I ever read. I was worried about it being too much about "improving game." It isn't and stresses this. It's about being the best version of yourself and how to present this to others including women. It also explains such and such is what a woman is thinking/looking for even if she isn't aware of it, and this is what you need to do about it, and how you can do it in an authentic, genuine way, that won't leave you feeling slimy. What about Andrew Ferebee’s performance did you like? He sounds sincere. I believe him. comfort talking to women is an extension of basic social skills and the later should be solid before moving on to the former. if it has a fault, it is at times he seems to be rattling off cliches. But those phrases only became cliche because they have been found to be true time and time again and bear repeating. Also they are peppered in appropriately. I.e. "Don't talk about it, be about it!" But like I said, what good motivational/self-help book doesn't stress the importance of implementing the contained knowledge? You'd imagine that a guy who says he hosts his own podcast would be able to sound anything like he wasn't terrified of reading aloud; no emotion and very rushed as he read in a super flat voice. The material he offers hardly meets his own bill of being tangible steps and is just him pitching his personal bootcamps. Motivation on Becoming a "Grounded Man"
There's no secret recipe. No gimmick. No trick. The book is very true to itself. The first part of the book was a very refreshing and motivational look on the importance of becoming the man you want to be first, before going after women. Second part of the book goes more in depth with the pre-stages of "chasing" a women to fostering a relationship. He goes in depth on texting, first dates logistics, getting her back home, what to do what not to do, and how to be a grounded man for her. My only disappointment is not in the content but the quality of the audio book. He stumbles with his words here and there. He rushes his sentences and the editing seems like it was done by a beginner. If you can look (hear) past that it is a great and motivating listen. Great and straight to the point ! What did you love best about The Dating Playbook For Men: A Proven 7 Step System To Go From Single To The Woman Of Your Dreams? What other book might you compare The Dating Playbook For Men: A Proven 7 Step System To Go From Single To The Woman Of Your Dreams to and why? 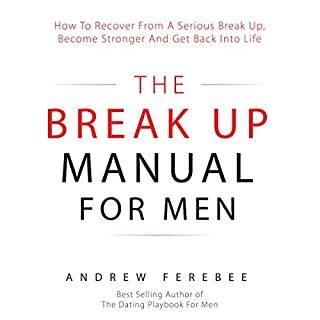 A must read for all men, whether they are single or in a relationship. This was an amazing eye opener for me. This author spends 90% of the book explaining theory. Very few details about how it is to be accomplished. Gives bad advice About practicing hitting on girls in bars and clubs. Even if you hate bars and clubs and have no interest in the type of girls who frequent them. Very few tidbits on the actual HOW! So annoying. It's awesome , as much about actions as it is about theory. Everyone looking for clear focused content , grab this audiobook. What would have made The Dating Playbook For Men: A Proven 7 Step System To Go From Single To The Woman Of Your Dreams better? There is ABSOLUTELY no original material in this book. It is COMPLETELY a re-hash (and often similarly titled) from other works. What was most disappointing about Andrew Ferebee’s story? There is no story. This guy hasn't got an original bone in his AFC body. What didn’t you like about Andrew Ferebee’s performance? Not a good speaker. Don't quit your Starbuck's job. Author should not have narrated it! What disappointed you about The Dating Playbook For Men: A Proven 7 Step System To Go From Single To The Woman Of Your Dreams? Disappointing book, read by the author in very constant tone and FAR TOO FAST! It's hard to keep up and being the author doesn't mean being the narrator unless you've had drama/voice/previous experience. I've given up on it, and the content as well which I find jumpy and not for me. Who might you have cast as narrator instead of Andrew Ferebee? Just someone who could read much more slowly, with pauses, and who you can actually listen to for 5 hours. It takes skill - I'd have gone with an experienced audiobook narrator. This is one of the most helpful books I have read about dating and relationships. It has so much information that I had to read it 10 times ! Really interesting to listen to. Most books created on dating embraces the idea of "game". The dating playbook for men allows you to truly be yourself while being successful, no more lies, cheesy pick up lines or playing games. 7 steps are easy to take on board and apply. Great book! Inspiring, a lot of knowledge that can be easily applied in real life. Love it! 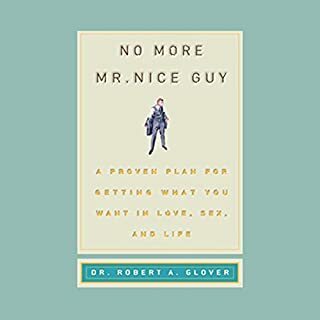 I really enjoyed listening to this book as I personally would like to be better at approaching people(not necessarily just women, but people in general). I found this book to be really engaging and I learnt a lot. I was however a little disappointed in the edited of the narration. Some lines are repeated and I had a few moments where there was some black space in the middle of sentences. It can be a little frustrating but if you cam get around it it's definitely a good listen/read. Found the book to be clear and concise in relation to the subject matter. In addition, l like the practical components included in the call. Great book, the step by step system is simple and informative. This book shows powerful information to change your life. Well done.